Harley-Davidson doubled down on the premium features with its 2016 CVO Street Glide. 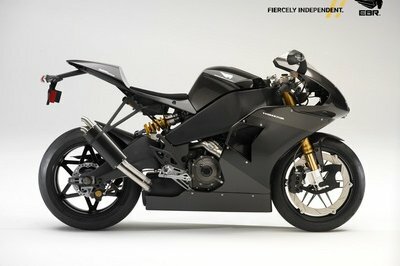 While the stock Street Glide, and its slightly better sibling the Street Glide Special, come with Project Rushmore innovations that make them premium bikes in their own right, the Custom Vehicle Operations (CVO) branch of the factory took that basic (and I use that term loosely) machine and beefed it up even more. On top of the Rushmore and CVO features, the 2016 model year sees a handful of improvements over last year’s offerings that push this ride even further into champagne country. CVO models are special, not only because of the features they host, but frequently because said features are first trotted out on a CVO model before finding their way into mainstream production on “lesser” models. Join me while I take a look at some of these new features that, while they are currently limited to the CVO, may become new design mainstays across the board in years to come. Continue reading for my review of the 2016 Harley-Davidson CVO Street Glide. 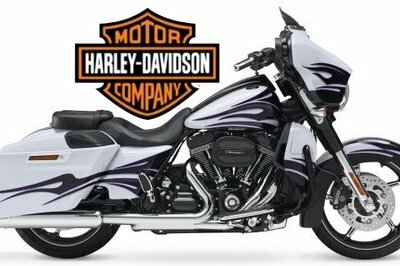 The overall basic design for the Street Glide CVO starts out way back in Harley’s FLH/T history, and this newest model carries the same heavy frame, fat front end and V-Twin engine configuration as the originals. 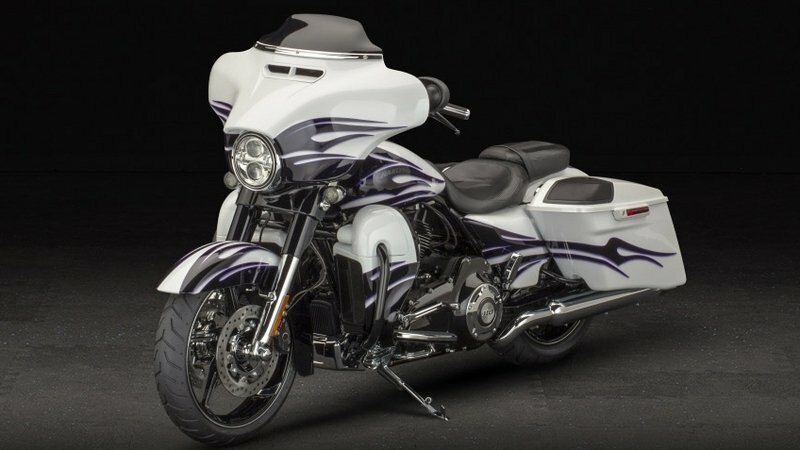 What we have here is essentially a dresser sans Tour-Pak, with leg guards, hard bags and splitstream-vent front fairing, and all in a color-matched paint package. All 2016 CVO Street Glides come with some sort of flame job in the paint, and though the black version looks like Harley’s standard Vivid Black at a glance, it comes with phantom flames laid underneath that become visible as the light plays across it. The early FLH/T models were a little tall and top heavy, and the seat was definitely a chunk, but the factory learned from that and this model features a low seat height, and something of a waist in the front of the seat and the chassis for a straighter, unchallenged path to the ground. A piece of dress trim covers the middle of the fuel tank, and it keeps the tank nice and clean with all instrumentation mounted in the inner fairing and a flush-mount fuel filler pushed off to one side. New for 2016, the front turn signals join the rest of the marker- and tail-lamps on the LED bandwagon, for maximum visibility and longevity. No way around it, motorcycles eat filament-type bulbs, and LEDs are infinitely brighter (read: safer), so I am glad to see Harley completely abandon the old french-fry lights. A supersmart key-fob now controls the proximity-activated security feature as well as the electric, luggage-locking device. Also noteworthy, but certainly not the least of the new features is the tire-pressure monitoring system (TPMS) built into each valve stem. The system feeds info through the infotainment system display, and even comes with an idiot-light on the odometer if you fail to check the TPMS regularly. The above gizmos come on top of the regular electronic suite which includes a 6.5-inch color touchscreen, numerous weather-proof speaker run through a 300 watt amp and USB port that allows you to use your smartphone as a plug-n-play jukebox repository. A navigational screen ties into the GPS grid for real-time location and route information. The Sirius satellite radio service combines with an AM/FM receiver to round out your music input possibilities. Bluetooth functionality, voice recognition and text-to-speech enables the use of your cellphone while cruising down the street – no need to pull over, or even touch the phone. Though it is a big, heavy ride, it isn’t quite as big as it looks. The wheelbase measures out at 64 inches long, much shorter than the 96.7-inch overall length would suggest. 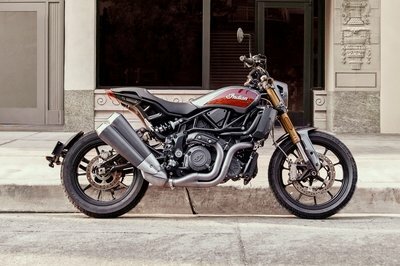 Ground clearance is about what you would expect at 4.9 inches, and the 26.3-inch laden seat height is about as low as it gets in a big bike. The steering head is set for 26 degrees of rake, which leaves the front end with a stable 6.7 inches of trail that should help the bike track well on the straights, though you may find it less than enthusiastic in the corners. Big, Brembo calipers bind the wheels with four, 32 mm pistons in each of the dual front and single rear brakes. The brakes benefit not only from ABS, but also a linked-brake system that delivers braking pressure to both wheels according to need. Since the bike weighs in at 867-pounds soaking wet, it needs plenty of brakes, so I will leave off my usual complaints about complicated brakes – I think it is justified here. The front end floats on large-diameter, right-side-up forks, and all color packages come with a blackout upper fork shroud save the Atomic Red with Candy Apple flames, which comes chromed. External, coil-over, air-ride, emulsion shocks come nitrogen charged to reduce oil foaming and shock fade, and allow for infinite, and infinitesimal, preload and ride adjustment. Mirror-chrome Aggressor wheels complete the rolling chassis with a bit of bling, and Dunlop multi-tread hoops make the critical connection between machine and pavement. You can trace the family tree of the Twin-Cam, Twin-Cooled 110 mill all the way back to 1936 when Harley established its distinctive 45-degree, V-twin legacy. The same pushrod-actuated valvetrain — albeit from two cams instead of one or four — and basic engine layout makes the connection, but Harley wasn’t looking back when it designed this engine; instead, looking forward. At 110 cubic inches, this is the largest production engine from the factory to date, and Harley diverged from convention by adding a limited, liquid-cooling capacity that specifically targets the area around the exhaust valve seat and boss to draw waste heat away from this critical area. Good thing too, ’cause this plant comes with the “Harley Tax” included in its Screamin’ Eagle engine package, and it knows it can produce some heat. This plant cranks out 115.1 pound-feet of torque, more than most cruisers and tourers, and near the max for U.S. V-twins, so this ain’t your granddaddy’s bagger. This is a whole different animal altogether. Sequential port, electronic fuel injection manages induction, and keeps the mileage tolerable at around 41 mpg, a bit lower than average even for a big bike, but with plenty of performance to trade for any perceived lack of efficiency. A six-speed, constant-mesh transmission and belt final drive finish out the drivetrain and provide quiet power delivery and reasonable highway-cruising rpm. Some riders say the shifts feel clunky, but I prefer to think of the shifts as “decisive.” Besides, smoothly shifting a Harley has always required a certain amount of skill, so anyone who can’t manage it needs to acquire some skill. Score a CVO Street Glide in any of the four, new-for-2016 color combinations for $36,799, plus $200 more for the California emissions package. ABS, security, cruise control and the premium radio comes standard on the FLHXSE, so these won’t balloon the price, and neither will a Stage-1 since it comes built in. 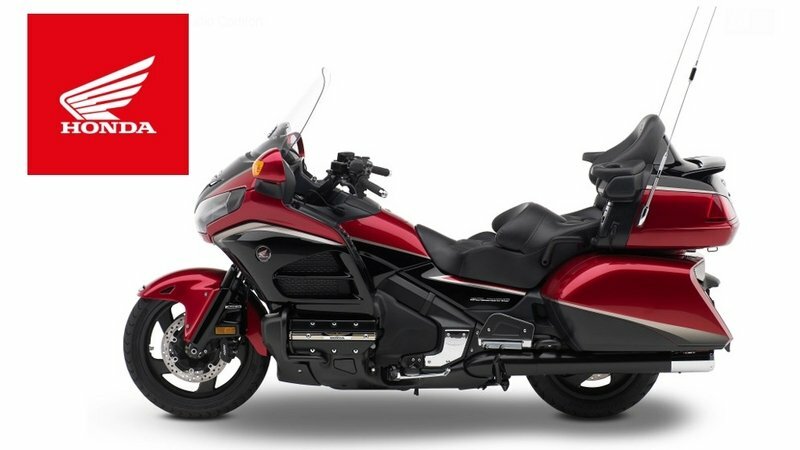 Since the Street Glide is exactly one bag (tour-pak) short of being a full bagger, I felt it fair to pick a touring dresser from another major player in the market; the 2016 GoldWing from Honda. Right off the bat, the Honda mill comes in at 111.7 cubic-inches, just a skosh bigger than the Twin-Cam at 110 cubic-inches, but it took six cylinders to get that displacement versus only two on the Harley. Honda keeps the figures close to the vest, but I can practically guarantee its flat-six does not pull stumps like the big H-D V-twin. Engine control between the two leave little to choose from, as they both run electronic fuel injection and ignition, with no variable engine maps or any such business to complicate the plumbing. One big difference is the mileage. 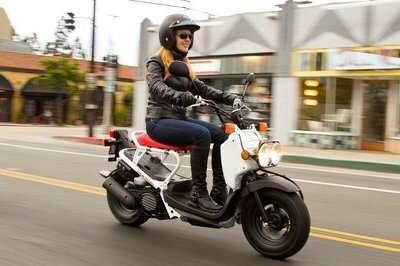 H-D comes in near the bottom of the range at 41 mpg, but the Honda only ekes out 35 mpg, and I have had mid-size cars deliver better mileage in much greater comfort. The GoldWing gains an edge with, shall we say, riders with less-than-stellar lower-body strength. It trades one of the forward gears for a five-speed transmixxer with electric reverse, a feature sure to endear itself to some riders. While the rake and trail on the H-D leaves it set up for straight-line stability, the Honda comes with 29.15 degrees of rake and 4.3 inches of trail, which makes it shine in the corners. Even with its mass approaching half-a-ton (900-plus pounds wet, plus rider(s) and cargo), Honda arranged the center of gravity to work with the rider rather than against him/her/it/the rider, and the steering geometry makes the GoldWing dive into the corners like a much lighter and sportier bike. The tradeoff is, of course, less stability on the straights and in crosswinds/pressure waves. As far as aesthetics go, it’s a matter of personal preference. Some people like the complete coverage of plastic body panels, and some prefer to see a well-designed and aesthetically pleasing engine and drivetrain. I have strong opinions on this subject (to say the very least) and so I leave it up to the reader to decide which is best for him. There is little to choose between the two suspension and brakes. 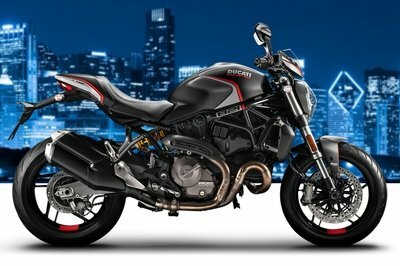 Both come with ABS and some sort of combined braking system, and adjustable rear shocks, and they both have a tire-pressure monitoring system for a little extra safety. Harley takes its biggest hit in the price category. At $36,799, H-D is far and away the prouder of the two with the Honda coming in over 10k cheaper at $23,999. 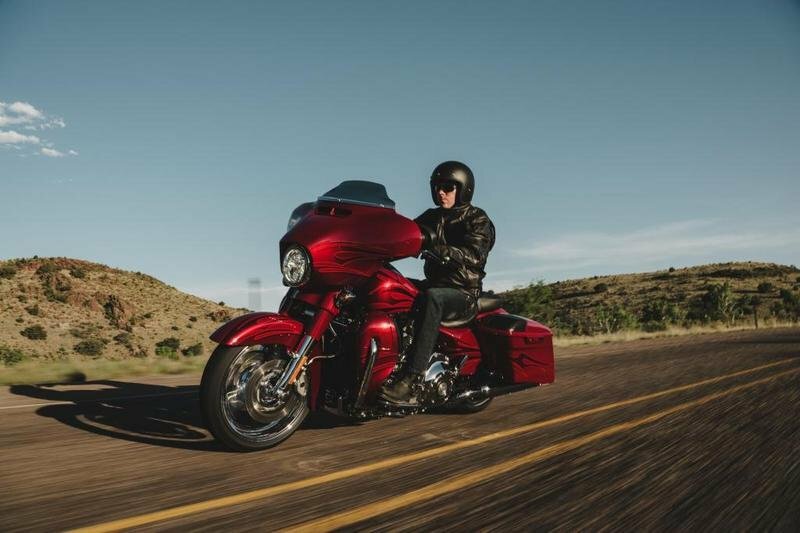 This is to be expected, and isn’t quite fair to Harley – the CVO features push it over the top, and the nearly-as-sweet, non-CVO, Rushmore tourbikes are much closer to the price of the Wing. 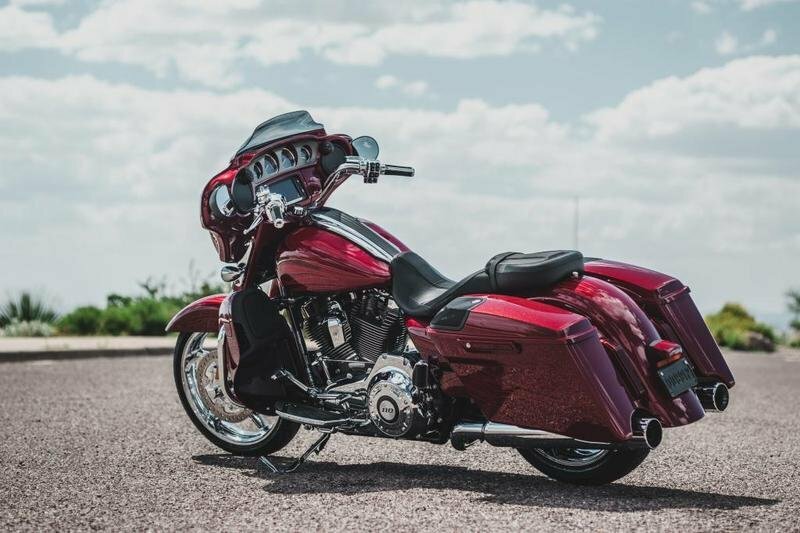 My wife and fellow writer, Allyn Hinton, says, "I find it hard to beat the Project Rushmore bikes and the CVO models are the luxury rides, hand assembled by a single technician. 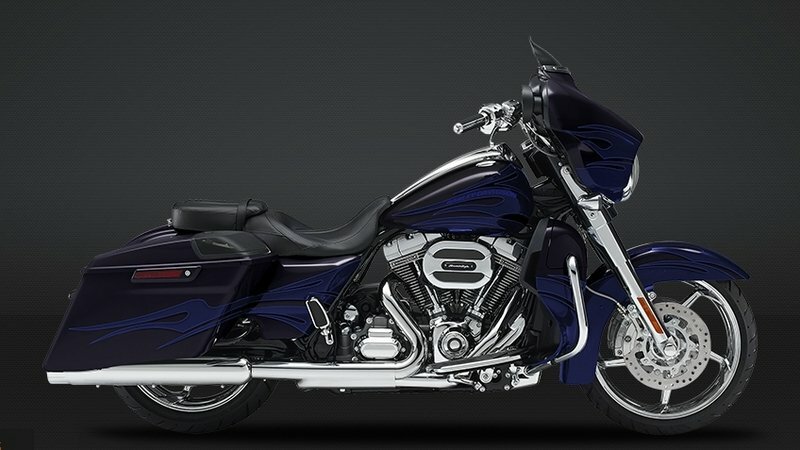 The CVO Street Glide is, according to Harley, the "ultimate hot-rod bagger" and I don’t see any reason to doubt that."